Campaign Chairs Andrew, Darrel, and Paul Morf (of Acumen Advisors and Simmons Perrine Moyer Bergman PLC) are just getting started with this year's UWECI campaign! Learn more about them and their goals for our community by reading their responses below. Andrew: I fight for the health, well-being, and vibrancy of our local communities. Darrel: I fight for the health and welfare of our community and a brighter tomorrow. Paul: I fight for children who don’t have the same socioeconomic and family resources that I have been lucky enough to have. I fight so that every child can enter kindergarten ready to learn. I fight so that children who experience trauma still have a chance to complete their education and fully develop their human potential. What is your hope and goal for this year’s campaign? Andrew: To reverse the trend of funding during the past several years so more resources are available to those who need them. Darrel: To turn a corner and show an increase in United Way giving this year. Paul: My hope is that we increase on last year’s campaign total. I want to move the numbers in the right direction again. List something good about working with your co-chairs. Andrew: I know them extremely well! This is usually a plus! Darrel: As the father of the other two campaign chairs, I appreciate the ability to use seniority when needed. Paul: It is great fun to get to serve as campaign chairs with my dad and brother. Working with people you love on a worthy project is a great privilege. How do you see East Central Iowans making a difference? Andrew: One voice and one donation at a time. Darrel: I believe East Central Iowans are striving to improve the quality of life for all of our residents with a focus on education, health, and well-being of our children. Paul: By ensuring every child has the resources to succeed in school and that every family in our community has a robust network of support in times of need, we will enrich and ennoble our community and ourselves. Tell us something about you personally. Your family, hobbies, volunteerism, etc. Andrew: My wife and I moved back to Iowa after graduating from college and have found it to be a great place to raise a family. We travel outside of Iowa often, however, and find this combination to be an ideal way to experience the world. Darrel: I am proud of my family that works on making our community a better place. I personally enjoy prairie restoration, travel, biking, and reading, as well as time spent with family. Paul: I am perhaps the luckiest man alive, working for a great law firm with my father in a great community, and living on a beautiful farm with four lovely ladies (plus, two beautiful dogs and about 23 very attractive chickens). I want to thank my wife, Jennifer, for supporting me, and my three girls, Nellie, Abbie, and Betsy, for inspiring me every day with their creativity, enthusiasm, and curiosity. And my partners and coworkers at Simmons Perrine Moyer Bergman for carrying more of the load while dad and I devote more time to this important endeavor. 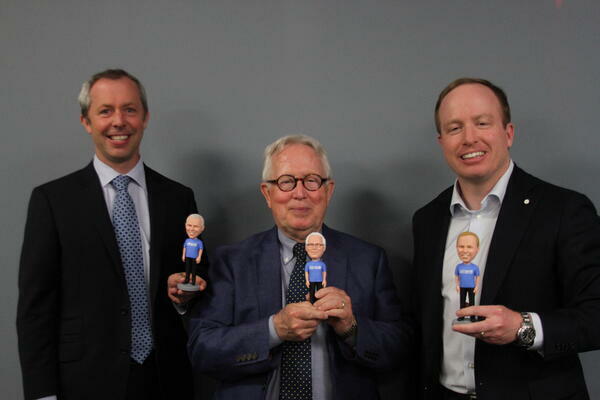 Look for these bobbleheads with #MorfsOnTheMove on our social media accounts. Reply with what you fight for with #uweci for a chance to win a prize!